Want to learn Vue.js from the ground up? Get an entire collection of Vue books covering fundamentals, projects, tips and tools & more with SitePoint Premium. Join now for just $14.99/month. With Vue.js, you can literally build an app around one of these services and start serving content to users in minutes. 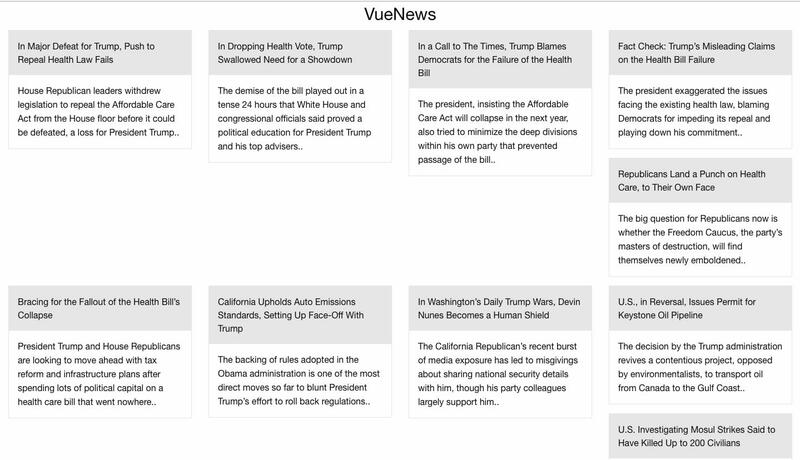 I’ll demonstrate how to build a simple news app that will show the top news articles of the day allow users to filter by their category of interest, fetching data from the New York Times API. You can find the complete code for this tutorial here. To follow along with this tutorial, you’ll need a very basic knowledge of Vue.js. You can find a great “getting started” guide for that here. I’ll also be using ES6 Syntax, and you can get a refresher on that here. app.js will contain all the logic for our app, and the index.html file will contain our app’s main view. We tell Vue what element to mount on, via the el option, and specify what data our app would be using via the data option. The v-for directive is used for rendering our list of results. We also use double curly braces to show the contents of each of them. Note: you can read more on the Vue Template Syntax here. To make use of the NYTimes API, you’ll need to get an API key. So if you don’t already have one, head over to their signup page and register to get an API key for the Top Stories API. Axios is a promise-based HTTP client for making Ajax requests, and will work great for our purposes. It provides a simple and rich API. It’s quite similar to the fetch API, but without the need to add a polyfill for older browsers, and some other subtleties. Note: previously, vue-resource was commonly used with Vue projects, but it has been retired now. Remember: replace your_api_key with your actual API key obtained from the NYT Dev Network area. Tip: Get Vue Devtools to make debugging Vue applications easier. In the above code, in the processedPosts computed property, we attach an image_url attribute to each news article object. We do this by looping through the results from the API, and searching through the multimedia array of each result to find a media type with the format we need. We then assign the URL of that media to the image_url attribute. In cases where the media isn’t available, we make the default URL an image from Placehold.it. We also write a loop to group our results array into chunks of four. This will take care of the distorted view we saw earlier. Note: You can also easily do this chunking with a library like Lodash. Computed properties are great for manipulating data. Instead of creating a method, and calling it every time we need to chunk our array of posts, we can simply define it as a computed property and use it as we wish, as Vue will automatically update the processedPosts computed property anytime results changes. Computed properties are also cached based on their dependencies, so as long as results doesn’t change, the processedPosts property returns a cached version of itself. This will help with performance, especially when doing complex data manipulation. In the above code, we register a global component using the syntax Vue.component(tagName, options). It’s advisable to use a hyphen when defining tag names, so they don’t clash with any current or future standard HTML tags. The additional options we introduced are explained as follows. Props: this is an array of data we want to pass down the component from the parent scope. We added results because we load that from the main app instance. Template: here we define the markup for the news list. Notice that we wrapped our list in a <section> tag. This is because a component needs to have a single root element, and not multiple ones (that would have been created by our div.row iteration). Note: components can also be created as single file components (.vue files), and then parsed by a build tool like webpack. Although this is beyond the scope of this tutorial, it’s recommended for larger or more complex applications. 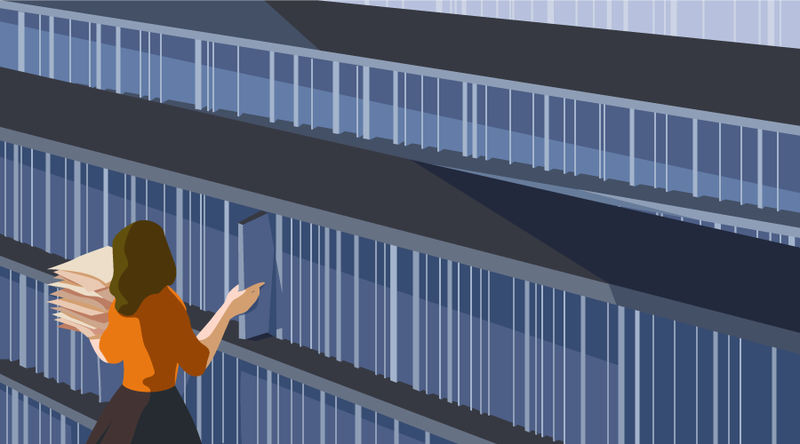 To take things further, you could even decide to go as far as making each article a component and make things even more modular. To make our app richer, we can now introduce category filters to allow users to show only certain categories of news. When the “Retrieve” button is clicked, we trigger the getPosts method for the selected section by listening for the click event with the syntax @click. I decided to add some minor (optional) touches to make the app experience a little bit better, like introducing a loading image. 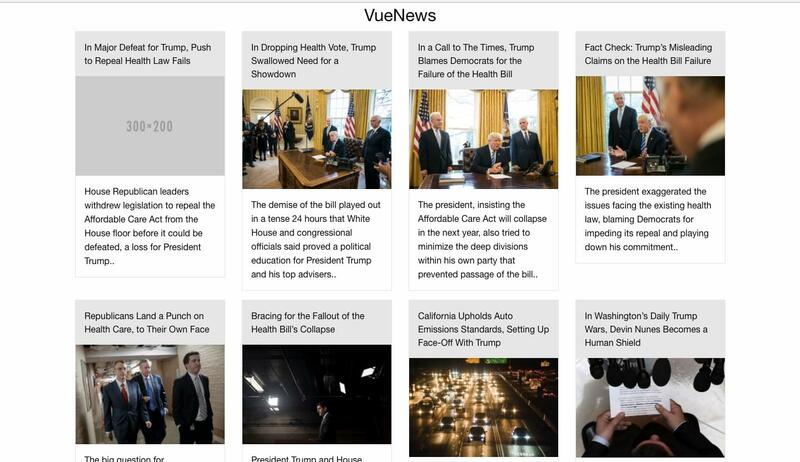 See the Pen VueJS and NYTimes News App by SitePoint (@SitePoint) on CodePen. Alternatively, you can view a live version here. In this tutorial, we’ve learned how to start a Vue.js project from scratch, how to fetch data from an API using axios, and how to handle responses and manipulate data using components and computed properties. The entire code for this project is also hosted on GitHub, so you can clone, run, and make any improvements you fancy.